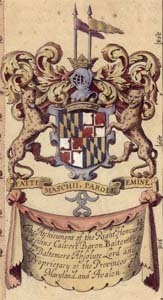 As a younger son of George Calvert, the first Lord Baltimore, Philip Calvert never inherited the title or his father�s proprietorship of Maryland. Yet he played an important role in ensuring the stability and successful development of the colony. Philip was born in 1626 and was only six years old when his father died. He was placed in the care of his half-brother, Cecil Calvert, who became the second Lord Baltimore. As a Catholic, Philip was not allowed to attend college in England, so he went away to school at the English College in Lisbon. In 1636, he married Anne Wolsey, the daughter of Sir Thomas Wolseley of Staffordshire, England. Like the Baltimores, Anne was a Catholic. In England, the king's forces had been fighting the Puritan supporters of Parliament in a civil war, and some of this conflict spilled over into the colony of Maryland. 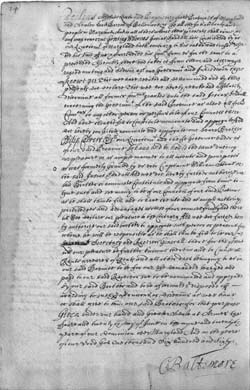 Radical Protestants, or Puritans, had seized control of the government of Maryland in 1654, but the English authorities had returned the colony to the Calverts in 1657. Maryland's government and the Calvert's control over the colony remained unstable, and Lord Baltimore needed a man he could trust to run the colony. In order to avoid angering further the Protestant settlers, Lord Baltimore did not want to select a Catholic as governor. He named a Protestant, Josias Fendall, to be governor, but appointed his half-brother Philip as councilor, court justice, principal secretary, and judge of probate so Philip would have some control and be able to look after the Calvert family interest. Philip and his wife Anne arrived in Maryland in 1656. For several years he helped to run the colony, until the governor, Josias Fendall, tried to take control of Maryland for himself. His attempt failed, and Philip became governor in his place, helping to preserve peace and authority in the colony. Unfortunately for Philip, because he was a younger son, he was not destined to rule for long. Lord Baltimore replaced Philip with his own son Charles. But because Philip had done such a good job running the government, he was named chancellor, a position second only to Charles. Philip made important improvements in how the courts operated and he helped pass laws to protect orphans in Maryland. He also helped ensure the peace of the colony by negotiating with other countries and colonies and with local Indian tribes who were harassing settlers. Philip was not as famous or powerful as his half-brother Cecil or his nephew Charles, but he made important contributions to the colony and in the process became a wealthy and well-respected man. When he died in 1682, he lived in a large brick mansion and owned over 3900 acres of land in Maryland. His coffin was recently discovered in St. Mary's City, and scientists have determined that Philip stood about 5'6" tall, was overweight, and had red hair or wore a red wig. He was right-handed and suffered from arthritis. MSA SC 2221-3-13 1671-1683. Philip Calvert, partial inventory of his estate and notes for payment, PREROGATIVE COURT (Testamentary Papers), MSA S 541-90-12 & MSA S 541-2-6. Transcript of partial inventory. Draft biographical sketch of Philip Calvert by Dr. Edward C. Papenfuse and Dr. Lois Green Carr, 1993. DOCUMENTS FOR THE CLASSROOM SERIES. Daily Life in the New World, 1634-1715. Designed and developed by Edward C. Papenfuse and Dr. M. Mercer Neale, prepared with the assistance of R. J. Rockefeller, Lynne MacAdam and other members of the Archives staff. 1993. MSA SC 2221-03. Publication no. 3916.